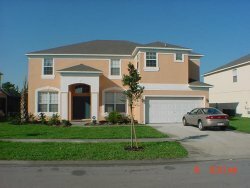 Living in luxury right on Disney's Doorstep, Our Executive villa is different from the rest, it has been designed with vacationers in mind and has everything you would need on vacation. It has; A 50x30 deck include huge pool and spa, a Summer Kitchen with grill, a poolside bar, which compliments the deck, you can relax on the loungers and have chilled drinks from the fridge. A Private Games Room including Pool table, playstation 2, air hockey and P.C and Internet access along with T.Vs in all bedrooms; is all included in the price. 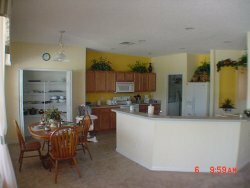 Located on the select Emerald Island, a resort style gated community, you and your family will be less than 3 miles from Disney. The Emerald Island clubhouse in the vibrant centre of the community where you, your family and guests can enjoy a friendly game of volley ball, or a relaxing afternoon by the pool, whilst the kids play in there specially designed play area amidst the landscaped gardens, The clubhouse is close to a trail for walking, jogging and bike riding that winds through the communities natural woodland setting. Inside you can partake in the fully equipped gym and fitness facility which includes spa, hot tub, sauna and steam room, or contact your friends on the free internet service provided, and if you are feeling peckish or thirsty visit the tiki hut by the pool. The Emerald Island clubhouse is also the source for premier service where staff will assist with dinner reservations, attraction tickets and transport to the parks the whole resort is a worry-free experience. Our wonderful spacious 7 bedroom home is truly enchanting. Enjoy our luxurious home for LESS than the price of a hotel room. Your vacation starts at the entrance with a palm tree lined boulevard entry, towering monuments and reflecting pools, sculptured dolphins sending forth plumes of water. The home itself is beautifully furnished with luxurious appointments throughout; including ceramic tile, quality bedding and spacious living rooms with over 3800sq ft living area. There are 2 emperor king master suites, both have 4 poster beds, 2 Grand Queen en-suites, and 3 twin bedded en-suites rooms, both Emperor suites have tub as well as walk in shower, this completes the 7 bedrooms. Not to forget the baby there is a portable cot, stroller, and highchair at no extra charge. The large fully equipped kitchen has every imaginable requirement supplied, along with a full laundry room, The kitchen has an island and nook for those quick snacks in the morning, the main living area has large screen TV complete with DVD VCR for your enjoyment, a c-d hi-fi and books completes the entertainment centre. 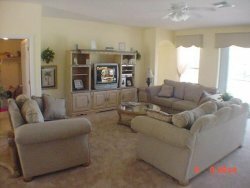 The whole house is air/heat conditioned for your comfort, all linens and towels are provided free of charge.